The vegetable selection is rapidly shrinking at local farmers markets with the arrival of a wet and chilly fall here in the Northwest. One of the compensations, though, is the arrival of beautiful squash in every imaginable shape, size and color. One of my favorites is the aptly named delicata. Like many of its cousins, this little squash boasts rich, sweet flesh that’s great in a soup, fabulous in a salad, and terrific in pasta. 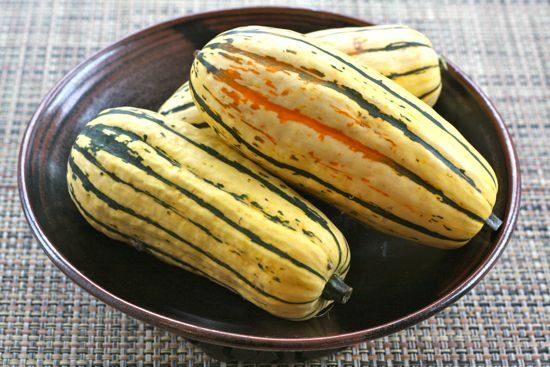 Unlike the better known butternut, Hubbard and acorn squashes, though, the delicata has skin that is thin and tender. For many dishes, you don’t even have to peel it. This is one winter squash that I can prep for a recipe without worrying that I’m going to take a finger off in the process. That alone would make it attractive in my book but I also love the way it cooks up quickly and takes to a wide range of flavor combinations. I like to steam the whole squash for 10-15 minutes, just until a sharp knife easily pierces the flesh. Then I can slice it open, scoop out the seeds, and use it in a stir fry, toss it with pasta, or stuff it with this stick-to-your-ribs blend of lentils, onions, mushrooms and greens. The recipe takes its cues from the inspired British “cookery” writer Nigel Slater. His encyclopedic cooking and gardening guide, “Tender, A Cook and His Vegetable Patch” (Ten Speed Press, 2009), holds a place of honor in my bookcase. Slater created his stuffing for a British vegetable called a marrow, which resembles an overgrown zucchini. The filling sounded perfect, too, for a tasty squash that resembles a fat zucchini in reverse colors. So I’ve stayed pretty close to the original. I steam the squash rather than baking it and throw in a handful of sliced mushrooms for woodsy flavor and meaty texture. Slater bills this dish as a cheap supper and there’s no denying that it’s economical. But I think it’s nice enough to serve company for a simple Sunday dinner. I’d consider it good candidate as well for a hearty vegetarian side dish to serve alongside the turkey on Thanksgiving. Just don’t tell anyone what a bargain it was. Bring 3 cups of water to boil in a large saucepan, add lentils and reduce heat to low. Simmer, covered for 20 t0 30 minutes, until soft and tender, then remove from heat and let cool. Meanwhile, wash squash and place in a steamer over boiling water. Steam for 10-15 minutes, until the flesh is easily pierced with a small sharp knife. Remove from steamer, run under cold water to cool, then slice in half lengthwise and remove seeds with a metal spoon. Remove stems and blossom ends of the squash and place halves, cut side up, in an oiled rectangular casserole. Preheat oven to 350 degrees. In a large skillet, warm the olive oil over medium high heat and add onions. Cook, lowering the heat if necessary to keep them from burning for 3 or 4 minutes. Add mushrooms and cook, stirring frequently, until wilted. Add garlic and tomatoes and cook until the mixture is soft. Stir in the chile sauce and a scant cup of water to make a sauce. Season generously with salt and pepper. Drain lentils and add to the onion and tomato mixture. Stir in chopped chard leaves and bring mixture to a boil. Lower heat, cover, and simmer until chard is soft. 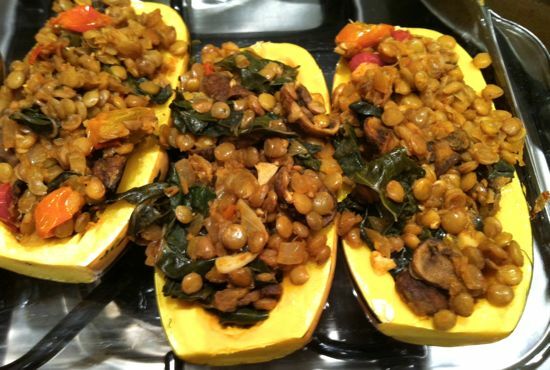 Spoon lentil mixture into the squash boats, mounding it up if necessary. Sprinkle tops with Parmesan, cover with aluminum foil and bake for about 20 minutes–until the savory aroma begins to fill the kitchen and the squash and lentils are heated through.